DIY Post all Hyundai DIY Guides here. You may also want to read some of our Hyundai Tutorials. Members who follow these guides do so at their own risks. I can't believe there's no DIY for setting your engine's timing. How's this? Add to the list? This is mandatory knowledge if you are changing your timing belt or water pump, or removing/installing a head or exhaust cam. If you mess this up you will need at least a new set of intake valves, up to a whole new engine. 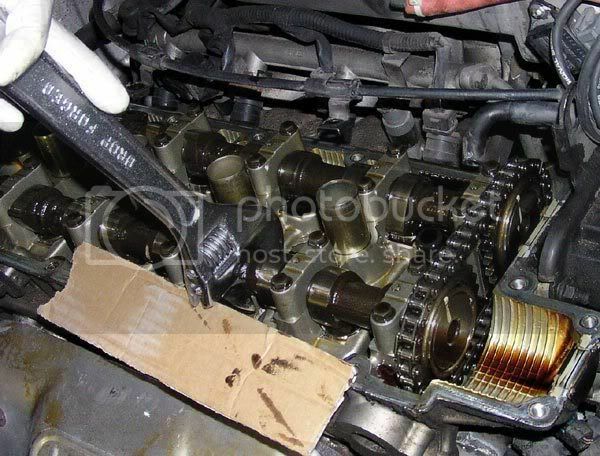 This is not a timing belt replacement or <span style="color:#0000FF">intake camshaft change</span> DIY. Timing belts wear out and need replacement. Even if it doesn't look as if failure is imminent, you <u>should</u> adhere to a 5 year/60,000 mile timing belt replacement schedule. I have read first-hand reports from dealership techs about timing belts failing with fewer than 65,000 miles. This is the only belt you <u>HAVE TO</u> change before it starts failing. Since you're going to be in there, replace the idler and tensioner also; they add minimal cost to the belt. Every other timing belt change, change the water pump, too. Any half decent auto parts store will be able to provide you with a belt, tensioner, idler, and water pump. Paying full price for top quality parts can always be done at the dealership. Tools: a good METRIC socket set with a breaker bar, large crescent wrench, allen wrench (4 or 5mm?). Beer: not recommended unless below "buzz" level. You REALLY don't want to screw this up! Time required: 5minutes to an hour, depending on how fast you are. Note to DIY'ers: if you can't figure it out based on this, keep studying. Go to hyundaitechinfo (formerly webtech) and read how Hyundai says you should do this work. This is not something you want to get halfway into and then try to guess how to fix! The white marks on the top pulley are about level with the bottom of the plastic valve cover / top of the cylinder head. NOT level to the ground. Looking through the hole in the spoke of the pulley, you will see a mark on the head when it's lined up right. There is a mark on the crank pulley, shown at about 10:00, that is in line with a groove on the pulley. Line it up with the mark cast onto the engine block. Tighten the belt (allen wrench in the tensioner). It should be "pretty tight." After it's lined up and the belt is tight, start the engine. If it whines like a supercharger from the timing belt, shut down and loosen the timing belt a LITTLE. Repeat the last 2 steps as required until the belt is quieter. It does NOT run silent. Listening to your engine with the timing belt covers off before undoing the belt is a good idea, if you can do it. 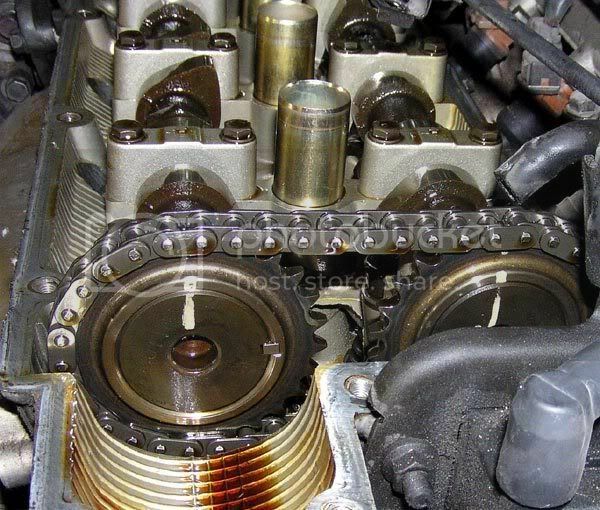 Setting camshaft timing: Not so tough. The upper timing belt pulley is the end of the exhaust cam. The other end of the exhaust cam is a chain sprocket. That chain turns the intake cam. 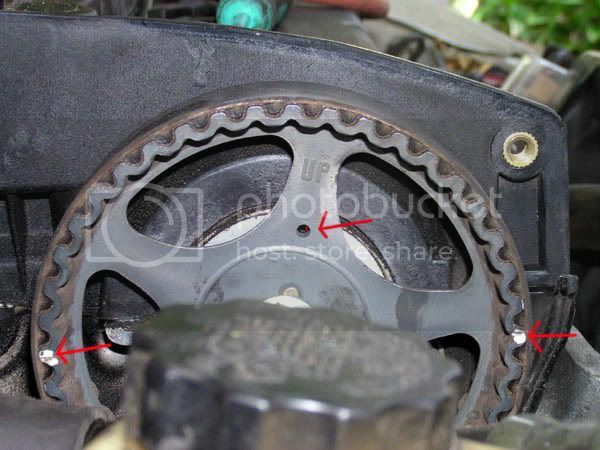 There should be 5 links of chain between the marks on the sprockets (count in the middle) as shown below. If you have had the intake cam out, the chain will be slack until the cam is tightened down. This is normal. Refer to the intake cam DIY linked above or you are in for a LOT more work. THIS is the way to turn the camshafts. There are flats cast into the exhaust cam for just this purpose. Protect the sealing surface of the valve cover gasket or else! The bolt holding the belt pulley to the exhaust cam can also be used for this purpose. If the valves are in good condition and the spark plugs are in, the cams (and the engine) will not spin smoothly. You will be fighting cylinder compression. That's one reason to use a long wrench or breaker bar for turning the cams. It's also why setting the cam chain timing can be tricky: you are trying to hold against peak static cylinder pressure and make single-degrees-of-rotation adjustments. Normal. To turn the crankshaft, temporarily install the bolt you took out of the end of the crank, and turn in the "tighten" direction. ONLY TURN YOUR ENGINE THAT DIRECTION. DO NOT TURN IT BACKWARDS WITH AN ELECTRIC WRENCH. The engine spins clockwise as you look at the timing belt end of the engine. That is the front. the transmission end is the back. Looking from the front, your engine spins clockwise. So does the oil pump. A couple of degrees anti-clockwise with a socket on a breaker bar is not going to kill it. Several fast rotations with an electric wrench while not pumping oil is a bad idea. Location: Los Lunas, New Mexico, USA. There hasn't really been a DIY just for this as most of the Cam DIY's have it in there. I know but we had a n00b asking about specifically this, and when <u>I</u> went to search, knowing what to look for, I had a hard time finding my own posts! No worries mate, thanks for the hard work. This is a good DIY and all but, how difficult was it for you to get the piston #1 at TDC on the compression stroke? 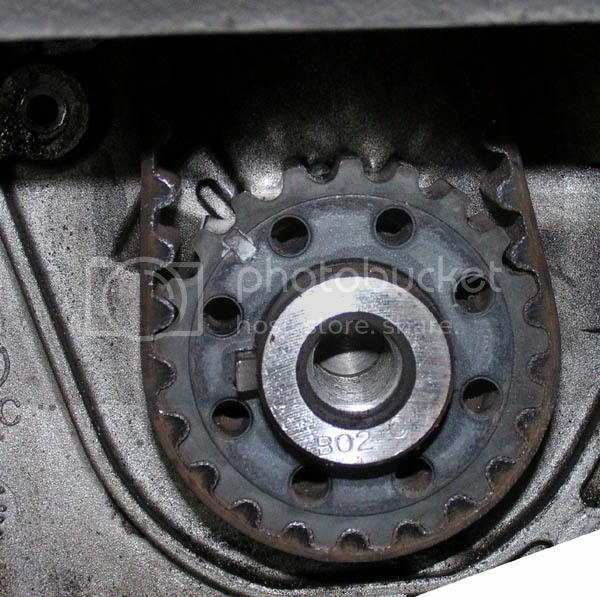 For camshaft timing, if the big yellow marks on the cam sprockets hat the timing chain sits on do not exist, what reference point is there to go by? There is always the possibility of using a screwdriver down the spark plug hole as a rudimentary height gauge. There is no difference IIRC between compression and exhaust strokes, speaking strictly of piston and camshaft position. The camshaft with belt attached and spark plugs out should not be very hard to turn over at all. As for the marks, if someone tells you 5 links its hard to figure out what they mean. there is another post someplace that shows how people are counting links. I cant find it at the moment but i think its a camshaft thread. I've always wanted to know how to properly time the engine (timing belt), and this is perfect! Great writeup. Someone add to the listing! Is there any good way to determine TDC other than the screwdriver in the spark plug hole method? Any particular mark or location or something? No offense, but. . . if you can't figure out how to count 5 links, even with a picture showing proper orientation, maybe you should rethink doing any mechanical work on your car.